wescale | your digital procurement workplace. Shop smarter – anywhere, anytime! Digitize your business processes now. Connect your employees, suppliers and partners across all processes in a global network. Integrate all purchasing applications centrally on a platform and create an environment in which not only your employees but also relevant applications can access and exchange shared data in a transparent way. Make an infinite number of applications accessible and available to your employees. wescale works for all – be it less than 100 or more than 100,000 users. 100 million items are available to your employees? No problem for the wescale search. 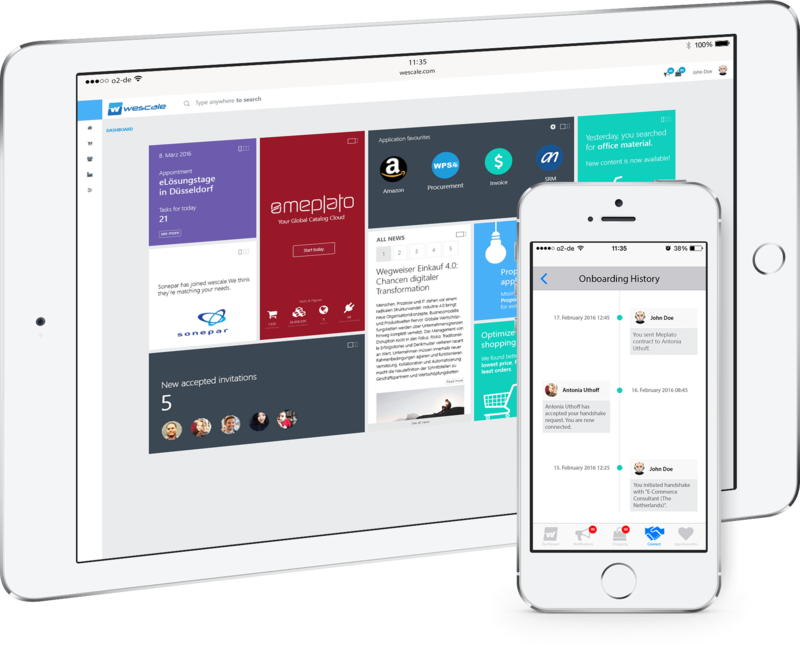 Use wescale as a central exchange and messaging platform for internal and external communication. Use wescale’s strong network to find new business partners. Implement your digitization strategy with wescale. Integrate your applications into the open wescale platform. As an open integration platform, wescale is not bound to products of a single manufacturer or by technical restrictions. Based on your settings, wescale suggests new business partners or displays automated savings potential. wescale connects people from different companies in a moderated online community. Exchange information with experts. Formalize your procurement strategies for regions and material groups and help your employees comply with them. wescale interacts with the users by giving them helpful tips on all the business processes to be implemented. This makes it easier for your employees to proceed in accordance with your requirements. wescale is a transaction platform for all integrated applications. All transactions are submitted centrally to you and your business partners via wescale. Directly compare your performance and the performance of your company to that of other companies on the platform. Use this information to find ways to optimize workflows and put them directly into practice with wescale. wescale makes all business applications easily accessible to your employees. When using SSO, you no longer need to memorize passwords and can start working immediately. All integrated applications have access to wescale’s task management. Whatever the context, all tasks converge in wescale and can be centrally processed. Do you want to learn more about how the current winner of the BME Innovation Award will integrate more than 200 applications until 2019? Read our wescale success story with Robert Bosch GmbH now! Shopping is a whole new procurement application that offers a revolutionary B2B shopping experience to its users. Whether in the browser, on the tablet or the smartphone. Have access to all business processes anytime and anywhere.